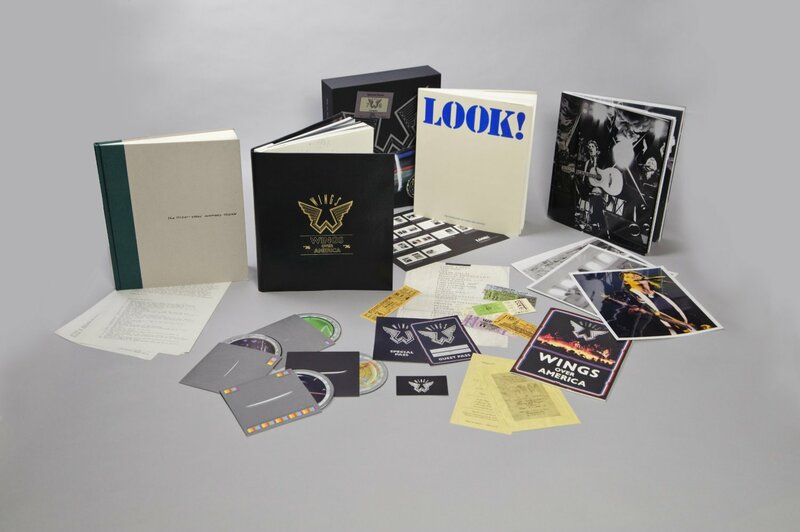 Paul McCartney announced last week that Wings' live album from 1976, Wings Over America, will be re-released May 27. Also being released, for the first time on DVD, the live concert film Rockshow. I might have, most likely, yeah I did, squeal a tiny bit upon hearing the news. These are the releases I've been wanting since the first of the Archive Collection was rolled out a few years ago. Out of all of McCartney's work, Wings Over America is probably the album I listen to most. I'll be emptying my piggy bank for this folks. Oh, but wait, that's not all. There are four books included too. There's the 110 page commemorative Tour Book, the leatherette-bound Tour Itinerary, Look! a book of Linda McCartney photos featuring Wings on the road and lastly, The Ocean View a book of drawings and sketches capturing the band on tour by Humphrey Ocean. The Tour Itinerary book alone contains a mountain of stuff or as the promotional material calls it, 'extravagant memorabilia' ... an appropriate description. On June 10, Rockshow will be released by Eagle Rock on both DVD and Blu-ray. I'm excited to finally have this on DVD; my VHS edition had to be put to rest. The footage was shot on tour in 1976 in Seattle. It was originally released on Betamax (later on laserdisc) but it’s only now that the complete full length concert is being made available fully restored from the original 35mm film and with restored & remastered sound, including a 5.1 mix for the first time. And then third, but by no means least, Eagle Rock has partnered with distributors Specticast who are releasing the film theatrically worldwide for a ‘one night only’ event on May 15th (see here for more details: www.rockshowonscreen.com) – meaning the film will be shown in more than 500 cinemas across the world! The theatrical release features an exclusive introduction with Paul McCartney, but there will also be an exclusive VIP premiere screening of ‘Rockshow’, with Paul in attendance and introducing the film, at BAFTA on 15 May 2013.